We already knew before the US elections that Donald Trump had the support of notorious white supremacists like the Ku Klux Klan. But since his victory, neo-Nazis clearly feel energised and hopeful that Trump will back their aims. And the President-elect’s failure to distance himself from them suggests that some of the things on their wish list may just come true. 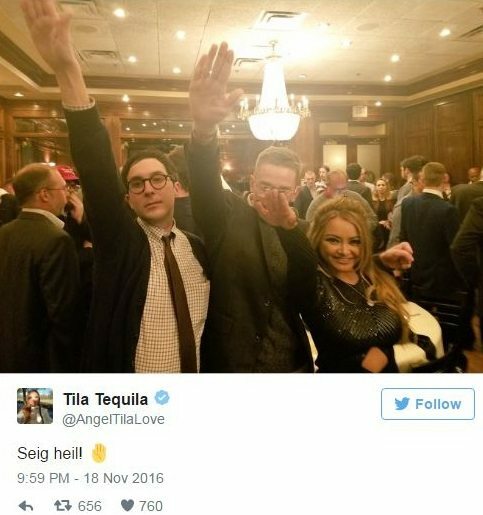 On 18 November, a restaurant in Washington DC hosted a white nationalist event. Its sponsor was the National Policy Institute (NPI), a far-right group which supported Trump’s election campaign. At the dinner, participants allegedly praised Adolf Hitler. 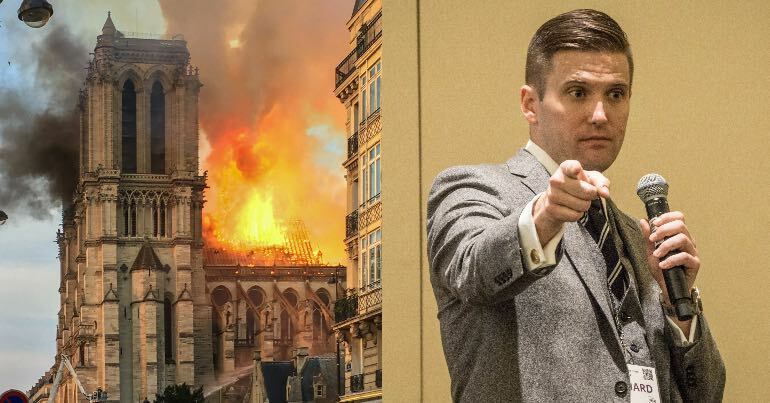 The New York Times, meanwhile, reported on how NPI President and Director Richard B. Spencer – a leading ideologue of the ‘alt-right’ – had spoken at the group’s annual conference on 19 November. There, he quoted Nazi propaganda, said the US belonged to white people, and suggested that media outlets had criticised Trump’s election campaign to protect Jewish interests (saying “One wonders if these people are people at all”). Just days before Spencer’s speech, Twitter suspended both his account and that of the NPI in a crackdown on “violent threats, harassment, hateful conduct, and multiple account abuse”. Hail Trump, hail our people, hail victory! The latter was a translation of the Nazis’ Sieg heil! salute. 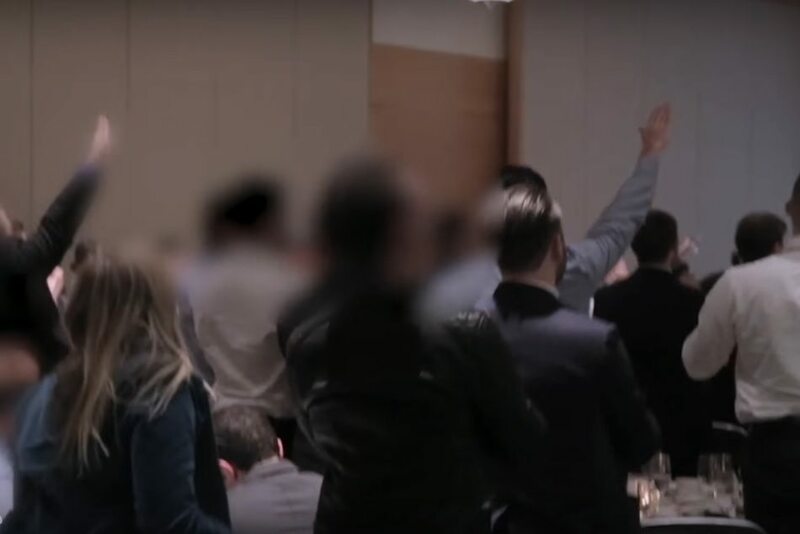 And if there was any doubt about the Nazi overtones at the conference, a number of audience members responded to Spencer’s words by making the Nazi salute with their arms. Spencer told the conference he had coined the term ‘alt-right’, saying the movement’s focus was on reaffirming white identity. Trump’s choice of Steve Bannon as campaign chairman and then chief strategist shows that the President-elect is very keen on keeping the far right on his side. Bannon previously ran Breitbart News – the most prominent ‘alt-right’ media platform. Many know Breitbart for its racist, sexist, and antisemitic headlines. Anti-immigration website founder Peter Brimelow, however, insists that “Trump and Steve Bannon are not alt-right people”, but that they had simply seized on two big issues that the far-right movement cares about. The Trump campaign’s opposition to immigration and political correctness, he said, had helped to ensure Trump’s majority among all demographics in white America (bar college-educated women). In short, Trump may differ in opinion with far-right groups on some issues, but he essentially co-opted them into his support base to ensure victory. 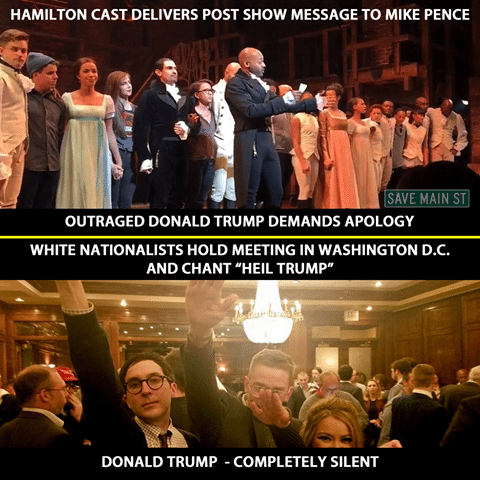 But Trump has at least distanced himself a bit from Nazi salutes, right? When Vice President-elect Mike Pence went to see a play recently, the actors told him they were “alarmed and anxious” about their future under the Trump Administration. And President-elect Trump jumped to Pence’s defence, seeing him as a helpless victim. He quickly appealed on Twitter for an apology from the cast. Note: The white nationalists allegedly said “Hail Trump”, not “Heil Trump”. Finally, on 21 November, Trump responded. Indirectly. A statement from Trump spokesman Bryan Lanza said Trump “has continued to denounce racism of any kind”. But the statement failed to condemn Spencer, the NPI, and other white supremacists who have been celebrating his coming presidency. There needs to be some very straight talking in the wake of Trump’s victory. The US has already suffered a wave of hate crimes since 9 November. And day one in post-election America was indicative of the hateful and divisive atmosphere that the Republican’s electoral campaign had encouraged. Tip-toeing around the terminology helps no one. Some Trump supporters talk and act like Nazis, so we should call them Nazis. We owe that to the millions of people from Jewish and other minority communities that Hitler’s regime murdered. At the same time, not all Trump supporters are neo-Nazis. True, it’s disgusting to think that voters could see his fascism, racism, and misogyny and still vote for him. But some people were desperate for change. And they sided with Trump over an opponent seen as a champion of the status quo, even when they’d backed Barack Obama and Bernie Sanders previously. But nuance aside, the fact is that Trump’s victory has inspired far-right nationalists throughout the world. They’re energised. They’re celebrating. And they’re working to turn people’s economic and political desperation into ethnic hatred. That’s what the Nazis did. And that’s what neo-Nazis want to do today. Which dream for the future will win? In short, the fight is on for the hearts and minds of marginalised and disenchanted communities throughout the world. And there are two clear contenders: nationalism and progressive politics. One with its scapegoating of minorities and its politics of distraction. And the other with its focus on the true causes of injustice and inequality, and a commitment to hearing people’s voices and supporting their communities. Will the dream of a divided world triumph? Or will the victor be Martin Luther King Jr’s dream of a united world, where people “will not be judged by the colour of their skin but by the content of their character”? If we want the latter, then we need to stand up and be counted.